Try this simple hot water experiment. Right now, go turn on the hot water in your shower. Turn the hot water as high as it will go with no cold water at all. Give it some time so that the water reaches maximum heat. Now, stick your hand into the water flow. If you’re afraid to do this because your hand will get burnt, then your hot water heater is set too high and you’re likely wasting a substantial amount of energy. 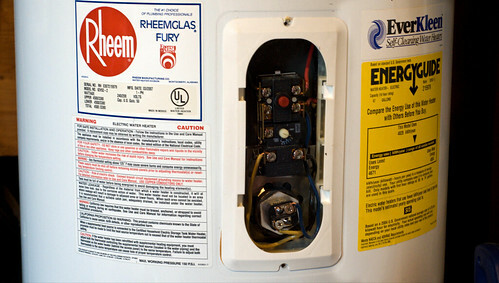 The Department of Energy recommends having your tank-based hot water heater set to 120 degrees Fahrenheit for most people, but if you’ve never adjusted the temperature on your hot water heater, it’s probably set to 140 degrees, which is the default setting from most manufacturers. The question I always asked myself when reading about this is why manufacturers have the default setting so high. After all, most people don’t enjoy a 140 degree shower, so why is the default temperature so hot? While there is a very slight risk of promoting legionellae bacteria when hot water tanks are maintained at 120 degrees, this level is still considered safe for the majority of the population. If you have a suppressed immune system or chronic respiratory disease, you may consider keeping your hot water tank at 140 degrees. However, this high temperature significantly increases the risk of scalding. To minimize this risk, you can install mixing valves or other temperature-regulating devices on any taps used for washing or bathing. In other words, unless you have a suppressed immune system, it’s more dangerous to have your water temperature at 140 degrees than 120 degrees Fahrenheit. How much does turning down the temperature save you? Turning down the temperature 10 degrees Fahrenheit on your hot water heater saves 3 to 5 percent on energy costs, so a drop from 140 F to 120 F saves you 6 to 10 percent. Annual energy costs for a hot water heater vary from $100 to $200, so this simple change could save you anywhere from $6 to $20 per year. It also keeps you from getting scalded if you accidentally turn up the hot water too much. If you find that you regularly want a shower hotter than 120 F, then play with the temperature controls on the water heater until you find a setting where you’re happy with the shower at maximum heat setting. That way, you maximize your shower enjoyment and your savings.